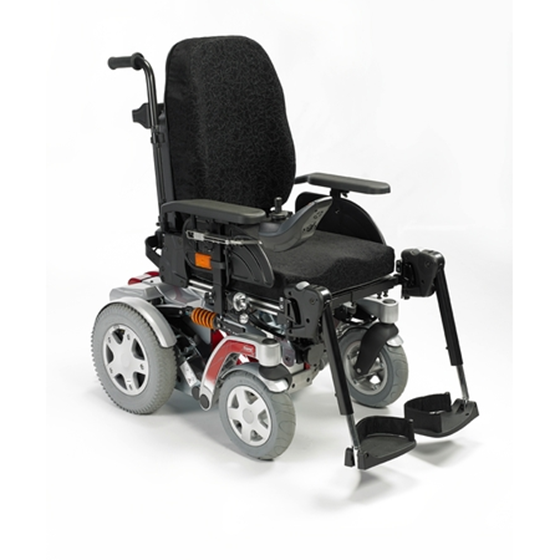 A powerchair with excellent power and performance. The increased shock absorption and traction helps to provide a smooth ride across rough ground. Price excluding VAT.(Incl. VAT £8,488.80) *VAT Relief available on this product. The Invacare Storm4 X-plore is the latest upgrade to the already popular Storm4 model with many exciting features. It has been designed to offer a fast and powerful drive experience at an affordable price. The Storm4 X-plore is a powerchair perfect for outdoor use. Improved shock absorption and traction provide a smooth ride across rough ground. With this in mind, it gives you the freedom to explore more places. Each wheel has its own high-end spring that can be adjusted to your specific requirements. Another major feature of this model is the True Track Plus motor system. These motors are brushless and will provide you with a travel distance of up to 37 miles on a full charge. They also allow exact speed adjustment with up to 40% more torque at slower speeds. The Modulite seating system is extremely adaptable and easy to adjust. It’s great to know that the seating is simple to adjust, providing you with extra postural support and comfort. You can fold the backrest to lower the overall height of the chair making it easier to store or transport in a car. The Storm4 X-plore has been crash-tested and is compatible with the Dahl docking station. You can choose whether to have solid or pneumatic wheels and castors. As you’d expect from a high-end powerchair, there are many options and features to choose from as extras. If you require any additional information on the Storm4 X-plore or any other of our powerchair range, please call us on 02392 255600. We’d be more than happy to help.